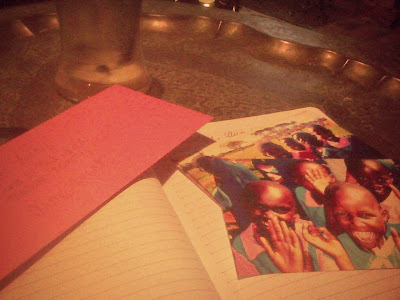 Tonight I got to spend a few hours with Amanda, Megan, and Bri, three of my fellow Kenya team members. We've all stayed in touch and, in just a few short months, Amanda will be headed back to Africa for a year to serve as an administrative assistant for a missions organization in Uganda. It all happened so fast, she told us. It was time for a change, she said, so she Googled, she applied, and the next day she was contacted by the president of the organization. After a series of phone and Skype interviews, she was accepted into the missions program and just this Monday, she was offered the job. Wednesday, as in yesterday, she accepted. I couldn't be prouder of my friend, my sweet, sweet Amanda who loves without hesitation. My dear friend who, every time she sees me, offers a hug or touches my hand or asks about the things that matter most to my heart. Being around her, talking and gesturing with our hands as we share our excitement for new adventures, feeds my soul. She is my sister in Christ. I love hearing how she told her interviewers, "Well, I'm not much of this" and "I'm not the best at that" with all the sincerity of someone who knows she has been saved by grace. I love seeing how they chose to accept her as a servant just as God has accepted us. I love how He uses us when we feel most inadequate to do what seems utterly impossible. Amanda, you are a disciple. Bri, you are a disciple. You're going back to the country we miss dearly to serve the people who stole our hearts last October. Thank you for carrying our little letters of love to them. I am praying for you. Megan, you are a disciple. I love the joy that lights up your face whenever you speak. Your transparent love for others, for the young and old alike, encourages me to do more, to give more, to let go more. I wish I had some more of the peace you seem to so easily possess. Friends, I love you all. And I thank God for your presence in my memories and my life.